관람차오르골, 에펠탑오르골, 비행기오르골 등 대만에서 수입되고 있는 Lavec라베끄 오르골이 TV방송 드라마소품 협찬상품으로 사용되고 있습니다. Rotating Ferris Wheel; Eiffel Tower; Airplane Music Box in K-drama - On the Korean KBS1 TV drama “It's my life (Bikyeora Unmyeonga=Leave It To Destiny = Get Out of My Way, Fate)”, KBS2 TV drama "Just Dance", JTBC TV drama "Sky Castle"
* Airplane music box plays ’cannon’ when you wind it up. 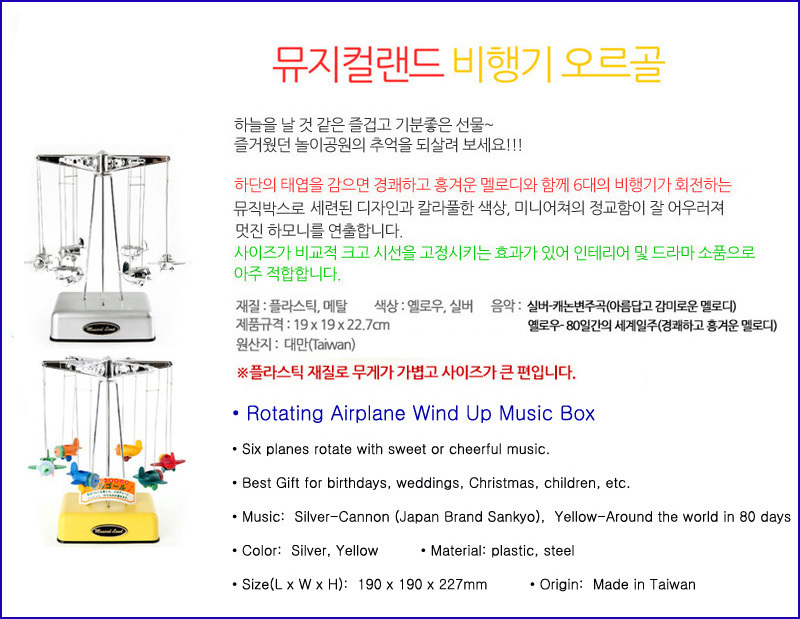 Musical Land Airplane Music Box(Silver/Yellow color) - Six planes rotate with sweet or cheerful music!